It is with a touch of sadness that I closed out the Artistic Gymnastics on Eurosport 3D yesterday and began to think about my top moments of the competition (see below). It had been an eye-opening experience for someone who had never previously been that close to the sport. Strength, artistry, poise, precision and incredible athleticism wrapped up in explosive flashes of action. I had always enjoyed watching gymnastics but – apart from some rather half-hearted vaulting and rope-climbing sessions during my school days – it is not a sport I had ever studied at close quarters. Until that is, I was detailed to commentate on it during these Olympics. People often criticise the choice of commentators for sports that are not their speciality. I can understand that but I am afraid this is how it works: like any television company that takes its sport seriously, Eurosport has a number of employees on its books who are either commentators in a specialist sport and/or work on the news desk. They are at the very least professional broadcasters. When a big competition like the Olympics comes along, these full-time broadcasters are redeployed to pick up different events. For example, the BBC used its cricket correspondent Jonathan Agnew to cover the Archery competion, probably on no better strength than that it was at Lord’s Cricket Ground. He had no previous knowledge of archery but is a first rate broadcaster. Such was the case for me – although I hasten to add I am several divisions below Agnew when it comes to the broadcasting league tables. My specialities are rugby union, which I cover for Eurosport, and, like Agnew, cricket – my first commentary was way back now in 1988. But in the last 24 years I have also been called on to commentate at various times on tennis, table tennis, athletics, football, swimming, ten pin bowling and polo – the last of which was a tad unfortunate as the SOS from SABC came just as I was finishing off a very imbibious lunch prior to a South Africa-Argentina test to which I had been invited purely as a guest. So to be asked to commentate on gymnastics was at the same time exciting and daunting. Exciting because it is such a great sport but daunting because of all the technical talk involved. How could I possibly learn the difference between a Yurchenko and an Amanar on the vault? What was a double Arabian?…you get the idea. Fortunately, unlike some television stations, Eurosport believes in the value of having an expert on the commentary team. Hence my fellow commentator Dave Crossan and I were joined by Ioannis Melissanidis, the 1996 gold medallist on the floor. That meant that David and I could anchor the presentation while Ioannis could bring an expert eye and talk us through the technicalities. It was a happy combination which leant colour and depth to some thrilling gymnastics. 1 – A gymnast requires not just technical excellence and a touch of artistry but a degree of courage as well. He who starts with a very difficult routine is reaching for the highest prize in the knowledge that one error could end it all. 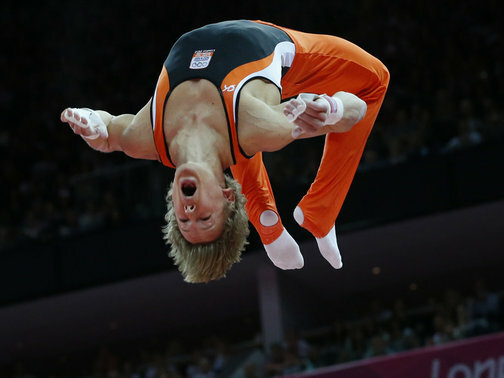 In the case of Epke Zonderland an error could also have meant serious injury. But the Flying Dutchman produced a hair-raising routine on the high bar, with a breath-taking series of combinations that had the crowd at the North Grenwich Arena gasping in awe and fear. And he was perfect. No mistakes and a deserved gold medal. 2 – Beth Tweddle is an equally adventurous gymnast on the uneven bars. Now 27, she had won the World Championship twice but never had an Olympic medal. Indeed, no British woman had ever achieved a podium finish. She qualified first in the bars and the NGA went dilly when she set off again on a high octane performance in the final. Like Zonderland she produced a heart-stopping performance right up until her dismount. Unlike the Dutchman, though, she didn’t quite nail the landing. A couple of steps and the gold had gone to the Russian Aliya Mustafine. But Tweddle did collect the bronze and the smile on her face at the medal ceremony showed just how much it meant to her. 3 – I don’t want to come across as too British in this piece but it would be wrong of me to overlook the achievemnts of the British team. When I was a kid, gymnastics really wasn’t seen as a British sport. When the Olympics came around, we would all admire the grace and skill and beauty of Olga Korbut, Nadia Comineci and co (I am afraid I never really took much notice of the men) but there were no Brits to look out for. In the last few years, though, there has been a sea change in the way gymnastics is perceived. Louis Smith got things rolling in Beijing with a bronze on the pommel horse and he went one better than that this time with a silver, losing out to Hungary’s Krisztian Berki on execution value after they had finished level on points. His teammate Max Whitlock added to the Brits’ day by taking bronze. With the British men – European champions in May – also winning bronze in the team event, the women reaching the final and Tweddle taking her bronze, it was an exceptional Games for the Brits. 4 – We all love a comeback and there were two superb ones in the women’s competition. Aliya Mustafina was on top of the world a couple of years ago but suffered a nasty anterior cruciate ligament injury a year ago. A place in London looked highly unlikely. But she fixed her knee and came back with wonderful composure. After helping Russia to the team silver behind the USA, she then took bronze in the individuall all-round and on the floor as well as a gold on the uneven bars. Arguably, her performance usurped that of Gabby Douglas, aka The Flying Squirrel, who won the women’s all-round and a team gold. The other comeback came from Catalina Ponor, the three-time gold medallist from Athens eight years ago. After quitting the sport in 2007, she found she missed it so much that she had to return. “It was like a drug for me,” she told Eurosport before the Games. The elegant, beautiful 24-year-old showed that, in spite of not winning a gold this time, the star quality never fades. A team bronze was followed by disappointment on the beam where she lost third to Ally Raisman after an inquiry. But she then made up for that with a delightful routine on the floor, not good enough for gold which went to the more powerful Raisman but still with enough quality to secure the silver. An example to the younger female gymnasts that there is life after 20, it would be great to see her in Rio in four years time. 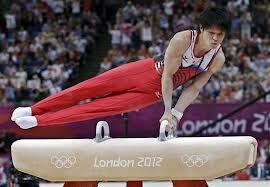 5 – Last but certainly not least, the Japanese Kohei Uchimura. Labelled by many as the greatest all-round gymnast ever, he had a slow start to the competition, only qualifying for the individual all-round in seventh spot. His uncertain dismount from the pommel led to a steward’s inquiry which saw Japan elevated from fourth to second in the team event. But any doubts about his form disappeared in the all-round final when he was imperious. Grace, elegance, strength across the six apparatus…it was a thoroughly deserved gold medal to add to his three world championships. A silver on the floor was a nice bonus. These are obviously just a few highlights. Apologies if your favourites aren’t in there. Feel free to add them below. It wasn’t gold but it was a medal nonetheless; it didn’t have the hometown glamour of Bradley Wiggins crossing the line to park himself on the throne. It won’t make a ripple on the news in New York, London, Paris, Munich…but it is a refreshing blast of good news for Greeks all over the world. The economy is a mess, the politicians don’t seem to have any clue whatsoever, the country is lurching in the wake of international aprobrium and feeble jokes about being in a double dip recession – the tsatsiki and the taramasalata are both off, apparently. In the shadow of all this, a medal is something to enjoy. It won’t feed people and it won’t provide jobs but it will give the people a little lift, a reminder that Greeks can go out in the world and hold their own. The medal in question was a bronze and it went to Ilias Iliadis in the under 90kg judo after he beat the Brazilian Tiago Camilo by yuko. Iliadis, who had won gold in the 81kg category at the Olympic Games in Athens when he was just 17, lost to Russian Kirill Denisov who was then beaten by the Japanese Masashi Nishiyama, the man that Iliadis beat in the final of the world championships two years ago. Dae-Nam Song won the gold for South Korea by beating Cuba’s Asley Gonzalez in the final. Iliadis and Nishiyama both took bronze. “Congratulations to the lad that won the very first medal for Greece in the London Games,” commented the Greek deputy Minister for Sports Yiannis Ioannidis who presumably couldn’t actually remember Iliadis’ name. It can be difficult, of course, remembering Iliadis name – and some people even question his Greek credentials. Anyone listening to Iliadis talking in Greek may well question his right wear the national colours. He stumbles pidgen-fashion and is far happier in Russian which betrays his Pontic connection. His journey to Greece nonetheless is a peculiar one which does not appear to have been fully explained. 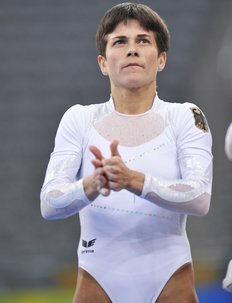 Born in Tblisi, the capital of Georgia, a country which is far more advanced than Greece in the world of judo, Jarji Zviadauri was adopted at the age of 12 by Nikos Iliadis who became the Greece national team coach and renamed Iliais Iliadis. His family remained in Georgia, his cousin Zurab Zviadauri winning the 90 kg gold medal at the Athens Olympics for a strange family double. Ilias’ natural father was ringside when he won his Olympic gold. There is no doubt about the legality of his citizenship but it is difficult to find an explanation of why a 12-year-old from a good home should be adopted and removed to a different country. Iliadis’ defection to Greece hit a nerve in Georgia with President Mikheil Saakashvili criticising him by name for his decision not to stay in the country. Aged 17, he was already European champion in the 81 kg category when he strode through to Olympic gold, the first Greek ever to win the top prize in judo, the youngest ever judo gold medallist. As he got older so he got bigger and he subsequently moved up to the 90 kg class, settling for silver at the 2005 and 2007 world championships. Then came the injuries. Knee surgery a month before the Beijing Olympics was hardly ideal preparation and he fell at the first hurdle, his Games saved perhaps by being given the honour of carrying the Greek flag at the opening ceremony. Surgery on the other knee a year later contributed to a third round loss at the world championships in Rotterdam. In 2010, though, Iliadis finally found himself free of injury and began to compete with more confidence. He took the bronze at the European championships in Vienna and followed up with two fifth places at top ranking events in Rio de Janeiro and Moscow. Then came the world championships in Tokyo when he overcame the local favourite Nishiyama. Iliadis, barrel-chested and stalking his prey with the intent of a powerful, single-minded bear, gave Nishiyama no option but to defend and retreat. Sadly, he wasn’t able to replicate that form in London. No gold medal this time – but a bronze is still a medal; and still a great excuse to set out the dips, crack open a decent bottle of Nemea and toast the fact that for Greece, architects of the Ancient Games, the 30th Olympiad is finally underway. In other Olympics news, Kohai Uchimura showed just how champions bounce back. The Japanese gymnast is considered the best in the world, silver medallist in the all-round and world champion for the last three years. He was the Dead Cert favourite going into London. The wheels came off though in qualifying on Saturday, his rythm and routines misfiring to such an extent that he could only qualify ninth for the all-round final, one and a half points behind top qualifier Danell Cheyva. That was followed by Monday’s team final when Uchimora’s dismount from the pommel horse saw him whacking his head on the side of the apparatus as the judges disappeared behind a screen of papers trying to work out whether he had actually completed his dismount. They did and Japan picked up the silver behind China. A decent enough return although a touch embarrassing for the man rated by many as the greatest gymnast there has ever been. He put all of that to rights on Wednesday. From the start of the all-round final he was the star performer, his troubles of qualifying a distant memory. He won it with a total 92.690 points – 1.659 points clear of silver medallist Marcel Nguyen. Leyva did well to bounce back from a poor pommel to clinch the bronze. Uchimura is a champion in every sense. Turn on the television news and what do you see? Death and destruction; blood and tears. The World at War. Four years ago when the Beijing Games were underway it was Iraq, Afghanistan, Sudan, Somalia, Darfur and Palestine. During London 2012 some of those are still kicking along but we also have Syria, Libya and who knows how many other trouble spots where widows and orphans are created every day. Bombs and bullets, corpses and coffins. Leading up to the Games, you may also have had a short item at the end of the news about the peripetetic meanderings of the Olympic torch relay. Perhaps even with a soundbite of one of the runners, maybe a politician or a film star or a sportsman, spouting an increasingly familiar line about the Olympic flame being the symbol of peace, unity and the brotherhood of mankind. Who are they trying to kid? Bang – news just in: another bomb has gone off in Baghdad.. Okay, so the cynics among us have a field day. How ludicrous even to talk of peace and unity when all of these terrible acts are tearing humanity apart? And yet. And yet. These were exactly the same circumstances that led to the foundation of the Ancient Olympic Games. Maybe not the suicide bombers but enough cruelty and outrage to stand comparison with anything that is going on today. 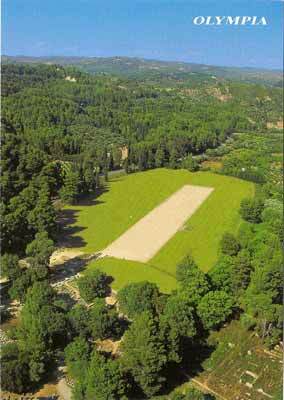 The Ancient Games at Olympia are generally believed to have been founded in 776 BC although Funeral Games were probably going on a lot longer. The honour of being the Ancient Greek Baron Pierre de Coubertin lies with King Iphitos of Elis, who is said to have visited the oracle at Delphi in a bid to bring an end to the civil wars that were plaguing Greece. The priestess advised that he should restore the Olympic Games in honour of Zeus, the mightiest of the Gods, and institute a truce for their duration. The king went along with the idea sending out messengers to the furthest flung outposts of the Greek colonies including Asia Minor, Egypt, Libya, Italy, France, Spain and the Balkans declaring the truce. And it worked. Originally the truce was just one month but it was extended to two and three months to protect visitors from further afield as they travelled to and from Olympia. During the course of the Olympic Festival men who might otherwise be lopping each other’s heads off, sacrificed, ate and wrestled together. The truce forbade states taking part in the Games from taking up arms, persuing legal claims or carrying out the death penalty. Anyone breaking this code of conduct was dealt with severely. Even Alexander the Great had to recompense an Athenian who was robbed on the way to Olympia. Olympia was the oldest of the Pan-Hellenic Games which included the Pythian Games at Delphi, the Isthmian Games at Corinth and the Nemean Games at Nemea. If the truce was intended to stem the violence across Greece then it worked but it did not stop the flow of blood of which there was plenty at the altars and in the ring, The middle day of every festival saw the sacrifice of 100 oxen on the Great Altar of Zeus. The legs were given to the God, the remainder formed the meat of the festival banquet. Some of the events were equally gory, notably the boxing and pankration, a form of wrestling. Boxing, as a sport, is reckoned to go back to Minoan and Mycenaean times while the Greeks like to think that Apollo beat Ares in the first ever boxing contest at Olympia. Sadly, the documentary When We Were Gods never made it on to celluloid. When it came to mortals fighting, the rulebooks, which did exist, seem to have gone out of the window. Almost any type of blow with the hand was allowed although eye-gouging was not permitted. Some bouts lasted hours and the only way to end these was for the two fighters to slug it out by taking it in turns to take an undefended punch at the other man – something that conjures up the image of Lee Marvin and Roger Moore knocking the living daylights out of each other in Shout at the Devil. Even in these circumstances there is always the Tyson factor, someone who takes it just that step too far. In one case at the Nemean Games a lad called Damoxenos jabbed his opponent Kreogas under the rubs with outstretched fingers so violently that he pierced his flesh and tore out Kreogas’ guts. It was a phyrric victory for Damoxenes; in accordance with the customs of the time victory was awarded posthumously to Kreogas while Damoxenes collected a lifetime ban from the stadium. As a forerunner to the rope-a-dope tactics of the great Mohammad Ali (light-heavyweight gold medallist in Rome 1960 as Cassius Clay), Melankomas of Caria, an Olympic winner in the first century AD, perfected the art of defensive boxing, skipping around his opponent until he was able to land the telling blow. It sounds like the kind of knock-about fun that Not-So-Mighty Mike Tyson might still go in for. He might even have made enough money out of it to pay off his debts as pankration was quickly taken over by the professionals. One of the most famous was Sostratos from Sikyon whose preferred form of attack was to break his opponents fingers in the early rounds. Another Pankratiast Theagenes of Thasos won 1,400 crowns at various contests which suggests he might have been pretty good while Polydamas of Skotussa was said to have strangled a lion with his bare hands. By contrast, wrestling was a mild form of controlled violence, still much loved by the Greeks. The greatest of all the wrestlers and an early claimant for the greatest Olympian of all time was an Italian called Milo. He won five successive victories at Olympia, which given that the festivals, like today, were held every four years, shows a remarkable retention of strength over 16 years. Steve Redgrave only had to sit in a boat for his handful of triumphs. Milo nearly made it six but was finally beaten by a younger man, Timotheos. That didn’t however stop the crowd – and Timotheos – from cheering the old boy and carrying him on their shoulders as if he had won. The Ancient Games were not all about blood and fighting, however. The track and field events were much the same as today with running races, long jump, javelin and discus and there was some chariot-racing to boot. Of the runners the name Leonidas of Rhodes stands out as the finest, his achievements eclipsing those of modern legends such as Jesse Owens, Emil Zatopeck and Carl Lewis. Needless to say, the people of Rhodes though he was pretty marvellous and he was made a local deity. The Romans, when they invaded Greece, took the notion of the Olympic Games to their heart, even transferring them to Rome for a short while. But it was under the Romans that first Olympia and then the Olympics themselves began to fall by the wayside. Olympia was sacked by the Roman General Sulla in 86 BC and then around 393AD, the curtain came down on the Games when Theodosius I, the first Christian emperor of Rome, banned all pagan cults, effectively shutting down the festival. The imposing Temple of Zeus was then burned down in 426. In the years that followed Olympia was devastated by war, earthquakes and floods. It wasn’t until 1766 that the Englishman Richard Chandler rediscovered Olympia and another 130 years after that that de Coubertin launched the first modern Games in Athens. It would be nice to think that today’s politicians could bring themselves to institute the notion of truce on a slightly broader front. But all they want, it seems, is a front row seat. Nice work, boys. I am going to be honest about this one. Although I used to enjoy watching gymnastics, I was never what you might want to call a fan. I fell in love with Olga Korbut when I was nine and admired – without falling in love with – Nadia Comineci four year later…but since then I have looked on at arm’s length. That began to change last summer when I met up a couple of times with Ioannis Melissanidis, the exuberant Greek, who won gold on the floor at the Atlanta Olympics of 1996. I was working on a book for the Olympics – sadly dumped at late notice by the publisher – and we were chatting about the pressures and experiences of preparing for and taking part in the Olympics. It was only then that I fully began to realise the pressure and strain on a gymnast’s body, the attention to detail, the hours of work and the lack of beer in the gymnast’s diet. One line, in particular, stayed with me. And boy did he fly. His routine is a wonderful mix of muscular gymnastics and Nureyevesque ballet. And that is pretty much what we saw from the USA women as they cleaned up the gold medal in the team event today (July 31), beating second-placed Russia by a whopping five points. It began on Sunday when they drilled the bejaysus out of everyone else in qualifying. Already world champions, they were undoubtedly the team to beat. The Russians had the best chance but the US were flying, almost literally, from the start, some wondrous vaulting on the first apparatus immediately giving them the initiative. Jordyn Wieber, surprisingly eliminated from the individual all-round final by two of her teammates, led the way with a vault that earned her a score of 15.933 before Gabby Douglas lived up to her nickname of the Flying Squirrel with a 15.966. McKayla Maroney then ignored her injured ankle to fire in another Amanar and log a 16.233 – an echo of Kerri Strug’s limping vault securing the US their only other women’s team gold back in 1996. It was poetry in motion and there was to be much more of it. Not just from the Americans. The Russians, Romanians and Chinese all had their moments but the Americans were too consistent in their brilliance to be troubled. The one perturbing thing about the competition is the youth of the gymnasts – they are girls rather than women – and the burnout. 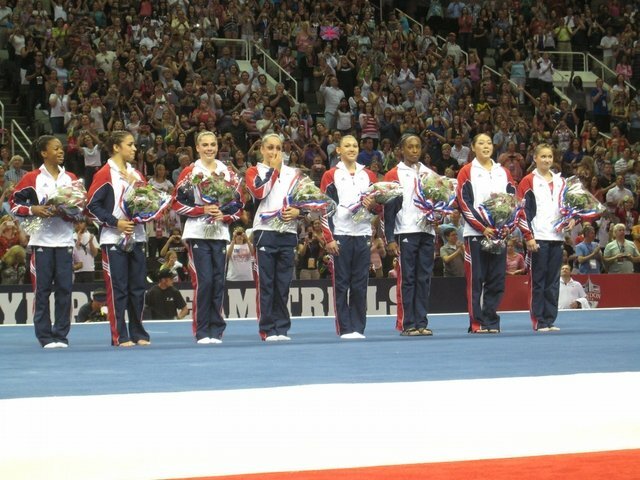 Four years ago, we were all talking about Nastia Liukin and Shawn Johnson…now aged 22 and 20 respectively, they are has-beens, listed as retired gymnasts. It hardly encourages parents to put their daughters on the beam. Three cheers then for the likes of Beth Tweddle anc Catalina Ponor, both in the mid to late 20s, and the extraordinary Oksana Chusovitina who is still going strong at 37, in her sixth Olympics. I was lucky enough to be commentating the final with David Crossan – you should follow him on Twitter for Eurosport in 3D. 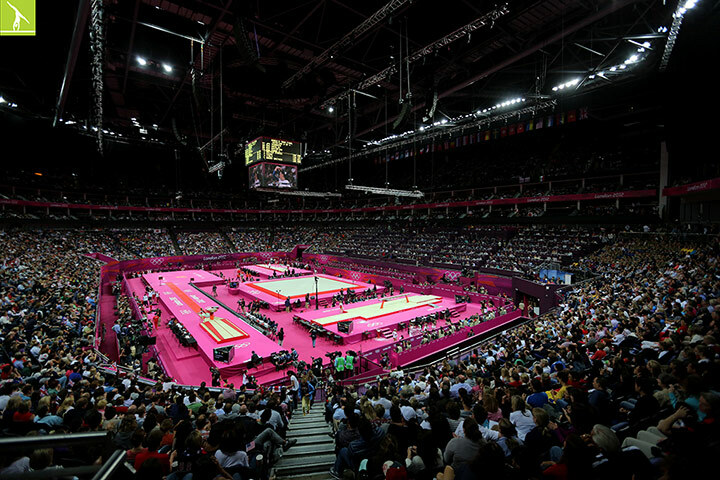 It is a wonderful way to watch, the gymnasts bursting through the screen. Well, okay, not actually bursting through the screen but giving you a sharp little wake-up call as they hurtle off the vault. An added bonus, incidentally, is Dave’s supreme efficiency at naming every song used by the women in the floor exercises – tonight he even picked up on Jude Law’s musical contribution to The Talented Mr Ripley. You can join us on Wednesday for the men’s individual all-round final. Sadly, I will lose my Mr Statto to the athletics track next week although the blow has been cushioned by the news that the aforementioned Ioannis Melissanidis will be joining me in the box for the individual apparatus finals. Incidentally, if you have never seen his gold-medal wining performance from the Atlanta Games of 1996, then spare a couple of minutes now to take a peek. Greece loves a drama, the more melodramatic the better. In Athens, and I am sure in all parts of the beautiful Hellenic world, this is evident in daily life. A yaya waddles for the bus and misses it, all hell breaks loose; wailing, gnashing, evil incantations, the works. A motorist edges out into the traffic causing a motorbike to slow down from the 100ks he was doing while smoking his cigarette, taking on his mobile and nursing his frappe and the world explodes. The decibel level goes through the roof with belly-aching screams of mutual loathing, the hands and fists pumping as if one or other is about to batter the living bejaysus out of each other. And nothing, of course beats an Olympic-sized drama on the eve of the Games. Eight years ago, the country went quite dilly when Kostas Kenteris and Katherina Thanou missed a doping test after, ahem, falling off their motorbike. The panel beaters would have done a good trade with the amount of breast-beating that was going on. 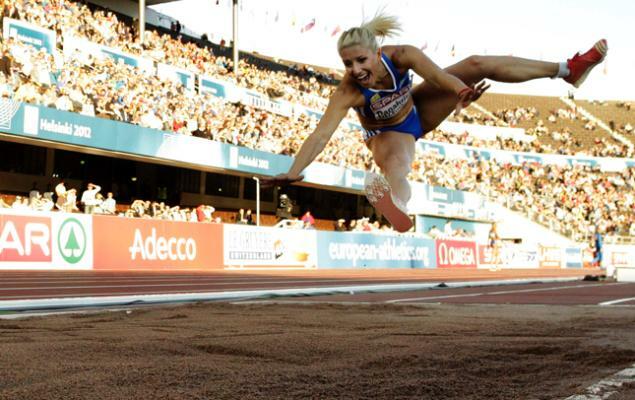 Well, now we have the case of Voula Papachristou, a triple jumper, who is off the team for what was deemed to be inappropriate use of the social media. Now, I have worked in offices in Athens where the management will sit doing nothing for weeks on end before lurching towards one of his employees to deliver a fierce and totally unjust broadside. The management and ownership of Greek companies are by and large playground bullies, ever eager to throw their weight around in a bid to come out looking strong and just and fair. And cowards. The target is more usually than not a) young and b) female, to wit the most junior ranks in the office. Hence when I hear about Papachristou being axed from the Greek Olympic team for tweeting a joke that walks an uncomfortable line between bad taste and racism, I cannot help wondering if this isn’t another example of the playground bully throwing his weight around, using a sledgehammer to smash open a nut. Erm, well it isn’t particularly funny and it is certainly in bad taste, especially given the immigration issues in Greece. But is it racist or just a bad joke? You see people make jokes about all sorts of things. Back in the 1980s there were numerous gags about AIDS, usually with some kind of gay twist. Did that make everyone homophobic? This kind of joke may be crude and may poke fun at the leper community but is it actually anti-leper? At what point does a joke go beyond the poking fun and actually become –ist? Everyone will have their own view on Papachristou’s joke. My own feeling is that she is guilty not so much of telling a joke that is racist but of telling a joke that isn’t very funny, rather like Daley Thompson’s throwaway line about a misspelt tattoo probably being Irish. Racism is, of course, a hot potato in Greece at the moment. There is a massive influx of immigrants from Africa, Iraq, Afghanistan and so on. Greece’s European colleagues have conveniently turned their backs on the problem leaving Greece to deal with large-scale immigration on its own. It has responded in heavy-handed fashion, using over-populated holding camps and making it inordinately difficult for immigrants to become legal residents. In the confusion of this year’s elections came the disturbing rise of Golden Dawn, the far-right party that is all but Nazi in its doctrine. They won seven per cent of the vote in the second election and now sit in parliament. This has perhaps made Greeks edgy about the whole racism debate. And Papachristou’s case might not have been helped by the fact she had retweeted comments that came from Golden Dawn. Even so, in the spirit of democracy, is it not somebody’s right to have freedom of political choice and freedom of expression? So far as I recall, no one suggested that the British Prime Minister David Cameron step down for his preposterous and some might say racist comments suggesting that Greeks would not be allowed to enter the UK if they left the Eurozone. Papachristou tried to make a joke and it backfired. She quickly apologized. She certainly needed a good rap over the knuckles and a severe dressing down about the realities of life in the public eye. But expelling her from the Olympic team was heavy-handed – an overreaction aimed perhaps at appeasing a national guilt with a big international statement.